Minnesota Dept. of Health Press Release. Eight outbreak cases of lab-confirmed E. coli O157:H7 were identified in Michigan, Minnesota, and Wisconsin. 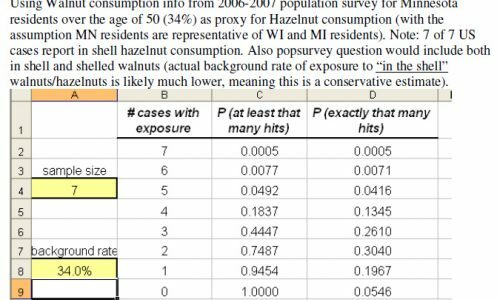 Initial, hypothesis generating interviews identified in-shell mixed nuts as a common exposure, specifically in-shell hazelnuts. A traceback investigation confirmed that the in-shell hazelnuts consumed by cases came from a common distributor which resulted in a press release and recall. Ultimately, the close collaboration between public health and agriculture agencies in multiple states, Centers for Disease Control and Prevention (CDC), and the United States Food and Drug Administration (FDA) allowed the identification of a novel vehicle for an O157 outbreak, with a very small number of detected cases. • Outbreak Investigation Case Series, Minnesota Food Safety Center of Excellence. • FDA Recall Press Release, March 5, 2011. • Minnesota Dept of Health Press Release, March 4, 2011. • Miller BD et al. “Use of Traceback Methods To Confirm the Source of a Multistate Escherichia coli O157:H7 Outbreak Due to In-Shell Hazelnuts.” J Food Prot. 2012; 75:320-7. 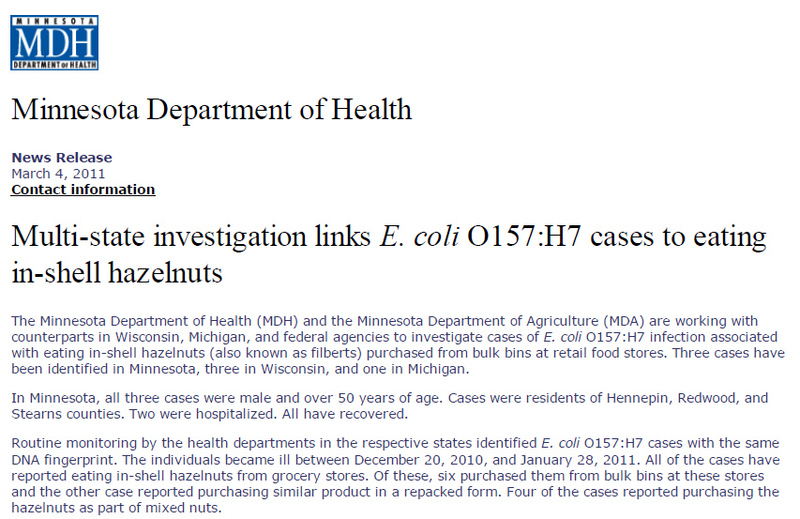 A multi-state outbreak of E. coli O157:H7 infections associated with hazelnuts. 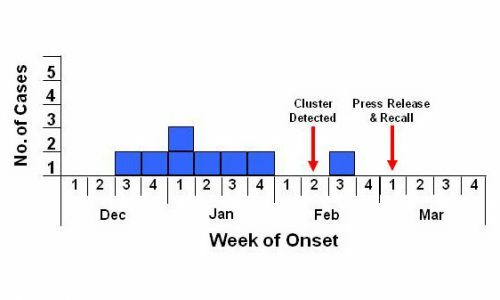 On February 7, 2011, the Minnesota Department of Health (MDH) Public Health Laboratory (PHL) determined that two human clinical E. coli O157:H7 isolates submitted through routine surveillance had indistinguishable PFGE patterns. A review of the national PulseNet database revealed four additional human E. coli O157:H7 isolates with the outbreak PFGE pattern in two states (three in Wisconsin and one in Michigan). A multi-state investigation was initiated. Eight cases from three states were ultimately identified in this outbreak Minnesota (3), Wisconsin (4), and Michigan (1). All three Minnesota cases were male and had a median age of 62 years (range, 55 to 64 years). All three cases reported experiencing bloody diarrhea and cramps, two (66%) reported fever, one (33%) reported vomiting, and none reported fever. Two cases were hospitalized, each for 3 days. No cases developed hemolytic uremic syndrome and none died. Upon initial interview, the first two Minnesota cases both reported consuming ground beef, sausage, lettuce, and nuts during the week prior to illness onset. Specific exposure information (i.e., brand and purchase location) collected on the ground beef, sausage, and lettuce consumed by the cases indicated these items were not from a common source. Upon re-interviews, all eight cases in the three states reported consuming in-shell hazelnuts also called filberts. 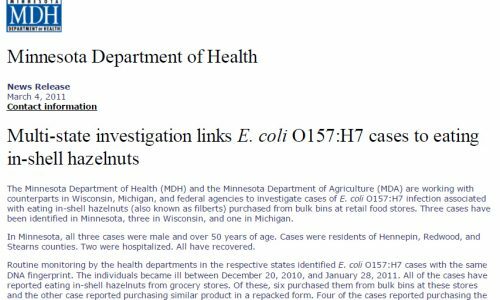 Four case reported consuming hazelnuts as part of mixed nuts, and seven case reported purchased hazelnuts from bulk bins at grocery stores. 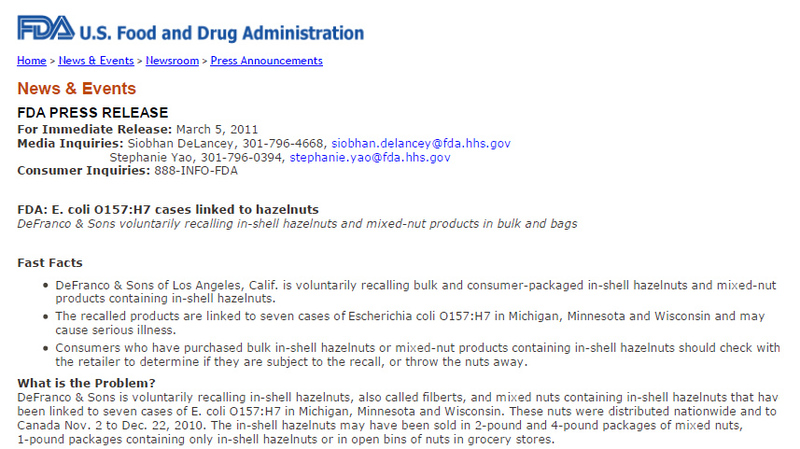 One Wisconsin case reported purchasing packaged in-shell hazelnuts. However, further investigation at the grocery store where this product was purchased revealed that these hazelnuts were re-packaged at the store after originally being sold from a bulk bin. A traceback investigation conducted by the Minnesota Department of Agriculture (MDA), in conjunction with the Michigan Department of Agriculture, California Food Emergency Response Team (CAL-FERT), and Wisconsin Department of Agriculture, Trade and Consumer Protection (WDATCP) found that the mixed nuts and in-shell hazelnuts purchased by cases originated from a single distributor, DeFranco and Son’s of California. 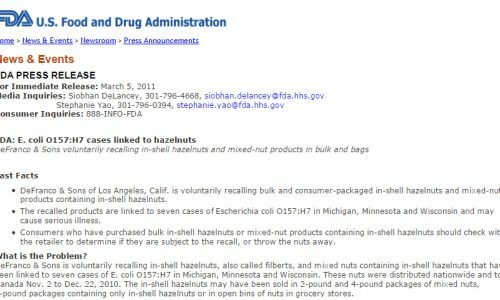 On March 4, DeFranco and Sons issued a voluntary recall of all hazelnuts and mixed nut products distributed from November 2 through December 22, 2010. Recalled product was distributed to stores in seven states (Minnesota, Iowa, Michigan, Montana, North Dakota, South Dakota, and Wisconsin). A press release was issued on March 4, 2011 to inform the public. 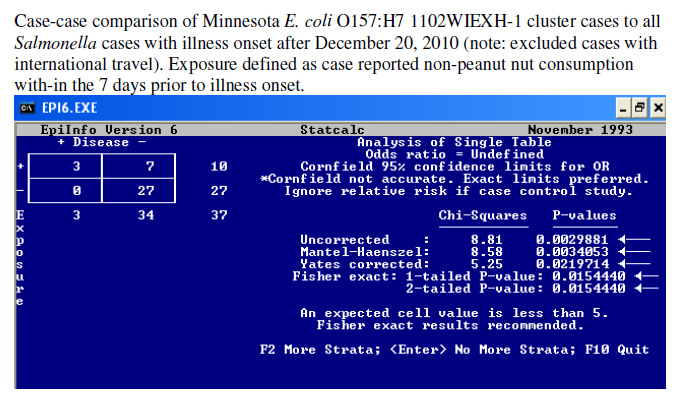 In-shell hazelnuts collected by MDA from a case patient’s home tested positive for the outbreak PFGE subtype of E. coli O157:H7 on March 3, 2011. Additional mixed nut samples that included hazelnuts collected from recalled retail product by WDATCP and collected from DeFranco and Son’s by CAL-FERT also tested positive for the outbreak PFGE subtype of E. coli O157:H7. DeFranco and Son’s received hazelnuts from two companies in Oregon but did not maintain internal product traceability. The FDA conducted inspections of the two Oregon companies. 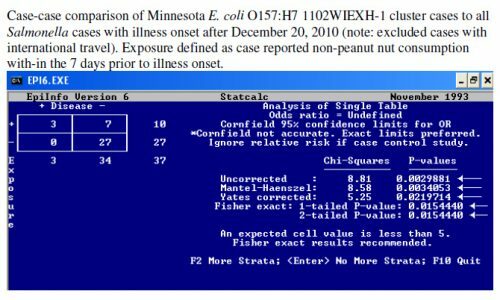 This was a multi-state outbreak of E. coli O157:H7 infections associated with eating in-shell hazelnuts grown in Oregon. Rapid collaboration between multiple state health departments and state departments of agriculture were crucial in identifying in-shell hazelnuts as the vehicle. This is the first documented outbreak of E. coli O157:H7 infections associated with nuts.